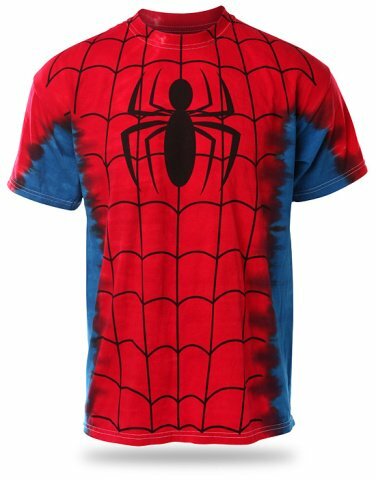 You will capture others in your web of style with this great Spider-Man Tie-Dye t-shirt. It's Peter Parker bitten by a radioactive spider from the 70s -- one that had also been hanging out at the local hippie commune. Marry you geek with your New Age freak. While you might expect a spider shirt to be silk, this fun shirt is 100% cotton tie-dyed in red and blue. The Spider-Man Insignia and webbing are printed on the front. Machine wash in cold water and hang dry for the best results. Sized for him, for her, and for kids. For more information or to order, click here.